Disclosure: This post is Sponsored. See Rafflecopter at bottom of this post for GIVEAWAY details to win $100 Gift card at Sears! When planning for holiday gifts, it is also a great idea to consider New Year’s goals. For years I have been writing about technology, reviewing and testing out the latest business and lifestyle devices. But when it came to my own house, I never had time to implement a full suite of connected solutions. We decided that starting in the New Year we would make a plan to update our home with smart technology. I recently wrote about the new Sears Connected Solutions “store within a store”, and shared photos from my visit to the San Bruno, CA location (click here to view post on Sears Connected Solutions). The trained experts at the store helped us learn about smart home automation technology options, so much so that we left with a long wish list. We enjoyed seeing such a large selection of products to choose from, organized in different categories such as wearables, media streaming devices, smart sports , wireless speakers, smart toys/games, electronics and networking and more.. The Sears Connected Solutions site also provided us with more information on smart home automation. The first item on that list was installing smart lighting. The Belkin WeMo LED Lighting Starter Kit seemed like a great place to start because we also wanted to try the Crock-pot 6 Qt. Smart Slow Cooker with WeMo. 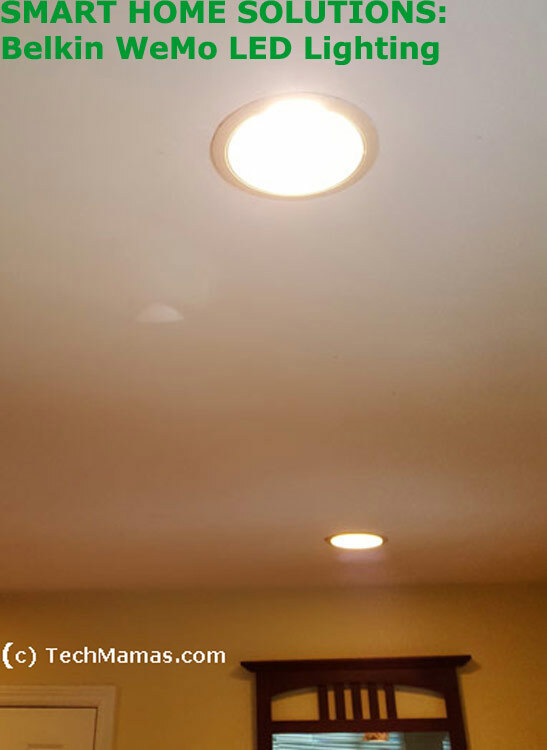 We ordered the WeMo LED Lighting Starter kit from the Sears Connected Solutions Store online and when it arrived we got started! Smart Home Automation here we come… I have this vision of being at the office and at the same time managing my house remotely instead of asking my teen and other family members do things such as turn down the slow cooker (and hoping they remember!). Step 1: We installed the lights bulbs. 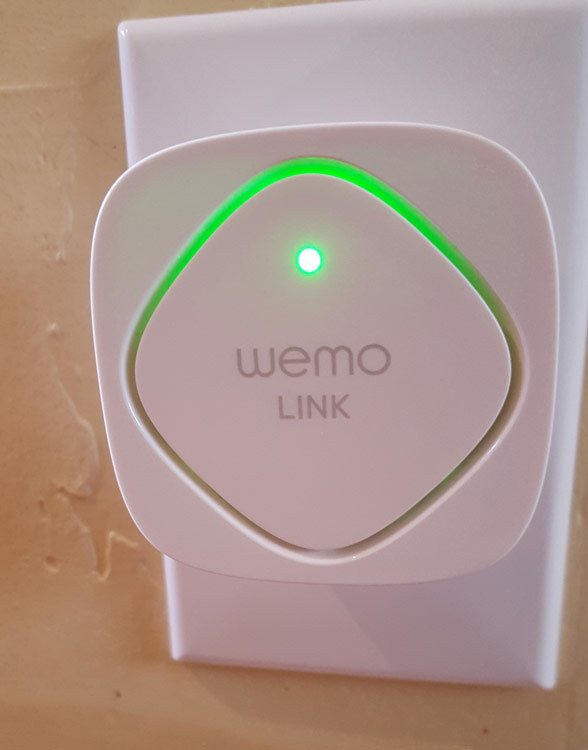 Step 2: We plugged in the WeMo Link (put into a central location). 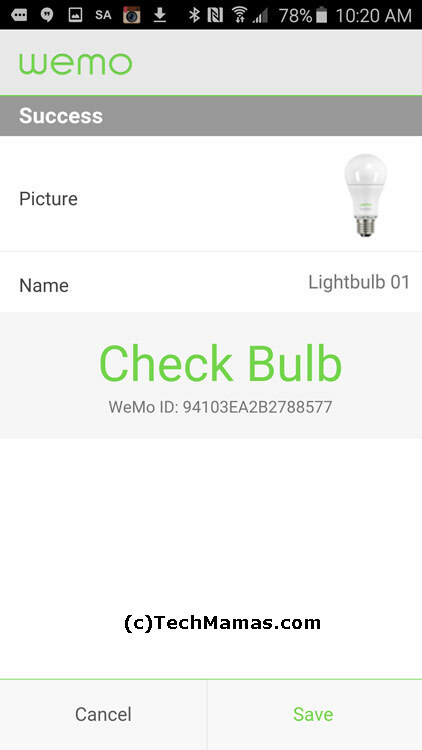 Step 3: We downloaded the App and paired with the WeMo Lights. 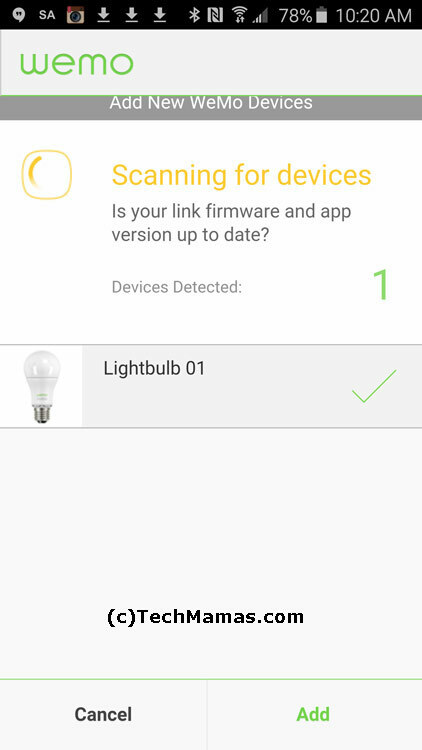 To pair the app with the WeMo lights, they need to be turned on and the WeMo link needs to be active. Step 4: We were able to control the lights with my smartphone! The whole family had fun turning on and off the lights.. But I was most excited about not worrying again about walking into a dark house because we can remotely control lights from anywhere, using our Wi-Fi network and mobile internet. Best yet, I read the manufacturers info and found out that WeMo Smart LED Bulbs only consume 10 watts of energy, produce very little heat and have a life expectancy of up to 23 years (based on 3 hours of use daily). I can group lights and even set a daily schedule to save even more energy! Home Entertainment: smart TVs, wireless soundbars, streaming media players and Smart Network 3D Blu Ray players. If you live (or are visiting) the San Francisco Bay Area, check out the San Bruno Sears Connected Solutions store or their other stores with Connected Solutions. And visit the Sears virtual Connected Solutions online. Follow the conversation @Sears #BringTheSleigh. What smart home solutions are you considering for your home? Share your wish list and be entered to win $100 gift card at Sears! Philips Hue White and Color Ambiance A19 Starter Kit is on my wish list. A Home Monitoring System is on my home wish list. I have so many smart home solutions that I think my home is now smarter than me! I love the idea of a smart slow cooker, though! On my wish list is a Home Monitoring System with a Smart door bell that lets me know who is outside the door before I open it! My connected home includes a smart doorbell, a few of these smart lights, and I really want one (actually two) of those biometric/app enabled door locks. I love Wemo products and have a few of them, but haven’t done the smart lightbulbs yet. Wemo makes things so easy to control, and your info totally proves that! I’m wishing for smart door locks and wireless charging pads! Smart Slow Cooker with WeMo. I love the concept of the Wi-Fi enabled slow cooker!! I would love a WiFi smart thermostat for my house. I would like to get a smart slow cooker for myself. I like the Honeywell WiFi thermostat. I would love to have a Honeywell WiFi Smart Thermostat. I would like the honeywell wifi smart thermostat. It would help me save on my bill. I need the Nest (Smart Thermostat) there are a lot of times I think I’ll be home but end up babysitting over night. The wifi slow cooker sounds great also so many new things I didn’t know even existed. Thanks for sharing. The Samsung 2.1-Channel 120Watt Soundbar w/ Subwoofer would be on my wish list!